How Big Is No Man's Sky? 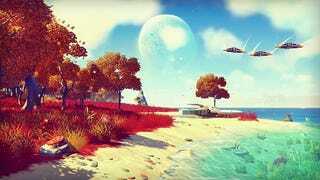 For years now, scientists, journalists, and other truth-seekers have dedicated their waking hours to answering one single question: Is the video game No Man's Sky gonna be big? If so, how big will it be? Investigators around the world, including some right here at Kotaku, have spent the last two years trying to solve this mind-boggling riddle, working the phones and flying from coast to coast as we fought near-insurmountable odds to find an answer, because you, dear reader, deserve to know just how big the upcoming sci-fi video game No Man's Sky will be. As Thomas Jefferson once said, "There is not a truth existing which I fear or would wish unknown to the whole world," and it is with that in mind we've battled to bring you this imperative, monumental truth: the video game No Man's Sky is, in fact, large. One day, perhaps our children or our children's children will ask where we were when we first found out that the video game No Man's Sky will be very big. "How did you find out?" they'll ask. "How did you determine how big it would actually be? And how many lives were lost in the pursuit of this truth?" We will tell them. And we will tell them it was worth it.